The weather is dreary, wet, windy and cold. Winter is definitely here. 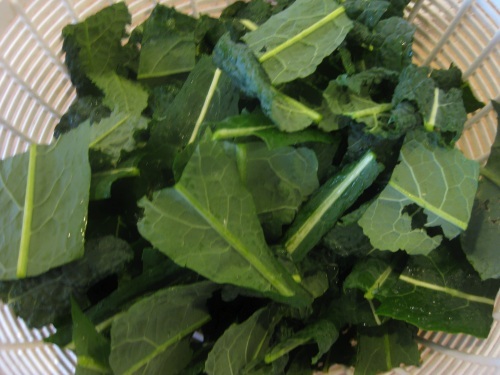 Despite that, the kale in our garden is flourishing with new leaves that I don’t want to lose to Jack Frost, so I have been harvesting frequently. Kale is a regular in my smoothies, so I tried freezing the leaves to have a supply in my freezer over winter’s worst months. I chopped up the leaves and thoroughly washed them evicting a few garden pests. Then I used a salad spinner to get rid of as much excess liquid as possible. 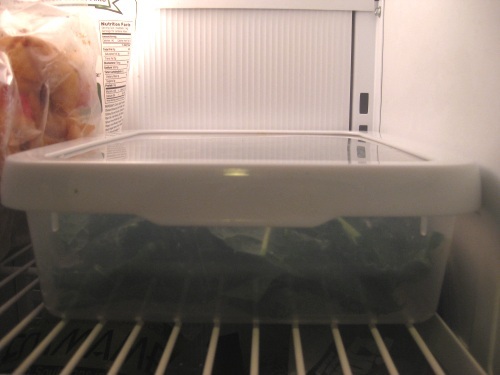 Then packed the chopped leaves into a freezer container and into the freezer. It worked out great, because the leaves are so thick, they froze in a solid form, not sticking together or crumbling and making it simple to pull the container out of the freezer and grad a handful for smoothies. 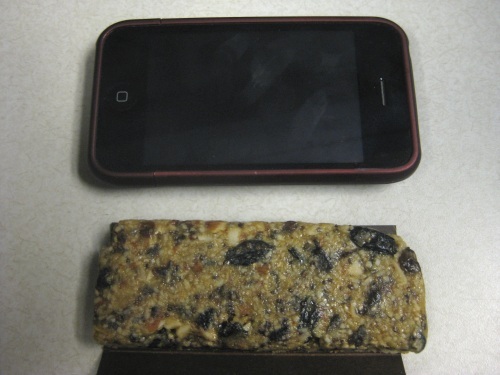 And works great for cooked dishes too. Since I’ve been dealing with an annoying cold this week, I’ve been craving a lot of soups like this one. Chopped apple, tofu cubes and chopped leeks simmered in a broth of curry powder, sweet potato and water I created in the blender. 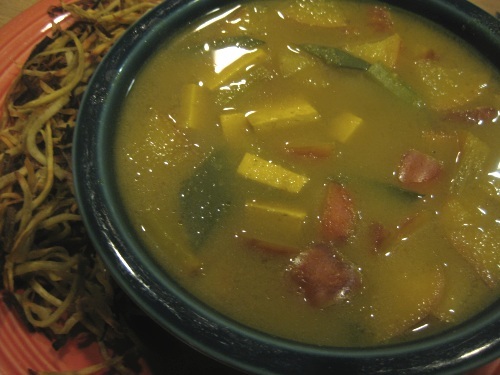 The pureed sweet potato chunks in the broth gave the soup a hearty, chowder-like texture and blended nicely with curry. The the soup went well with the shoe-string fries I baked using up the rest of the sweet potato. 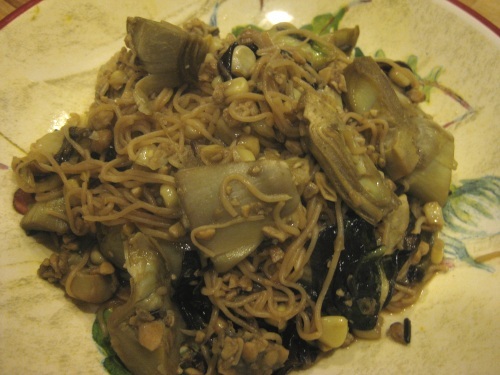 Purple bok choy (I think) from our CSA box, tofu noodles, frozen corn, frozen artichoke hearts and tempeh chunks stir fried with soy sauce. 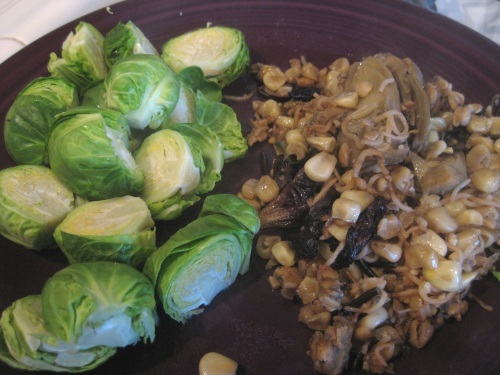 A crazy, culturally confused dish that’s not too pleasant to look at, but was actually very good and the leftovers were great the next day with some simple steamed brussel sprouts. 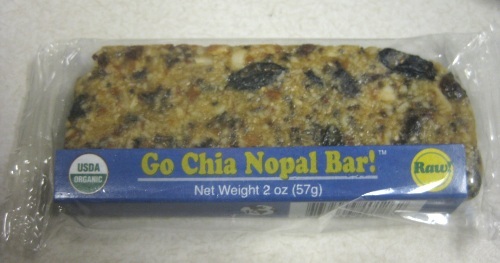 I also tried another snack bar this week for a lazy lunch at work, a Go Chia Nopal Bar that I impulsed bought in the Whole Foods raw section. And it was an interesting experience. 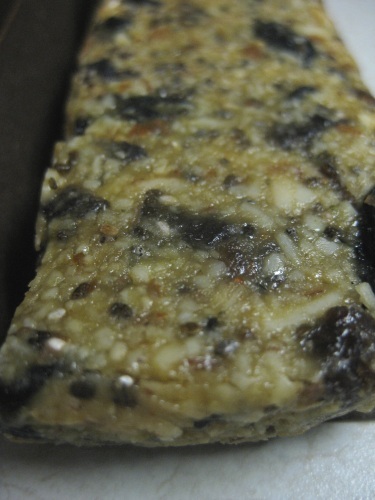 It’s a huge bar with a gooey texture that’s nice with the varying soft nut chunks and raisins. 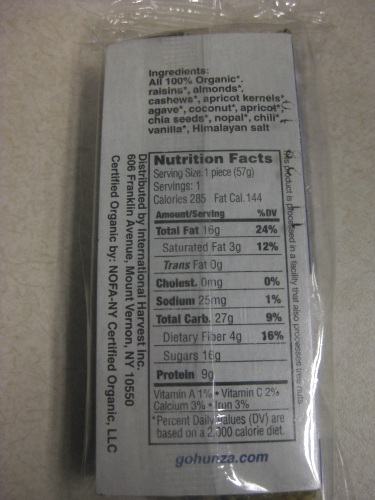 But notice one of the ingredients is chili and it was very present, a little too present, throwing of the sweetness and actually making my mouth burn a bit. On the plus side, it did seem to help with my sinuses, but it also didn’t sit all that well in my tummy. On that note, I’m off to another family dinner after fully trashing my kitchen making a vegan chili dish. Details soon, but I hope everyone has a great Saturday evening. all that food looks amazing!!!! Your cold…get well soon! The weather is MISERABLE down here..rainy, cold, windy AWFUL. Freezeing kale leaves. Duly noted, thank you! Looks like most of CA is rainy this weekend, crazy! Freezing kale is a great idea!!! I always toss some into my smoothies!